The Orbital ATK Antares rocket, with the Cygnus spacecraft onboard, launches at 7:45 p.m. EDT from Pad-0A, Monday, October 17, 2016, at NASA’s Wallops Flight Facility in Virginia. 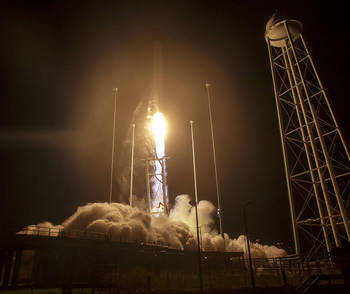 Orbital ATK’s sixth contracted cargo resupply mission with NASA to the International Space Station is delivering over 5,100 pounds of science and research, crew supplies and vehicle hardware to the orbital laboratory and its crew. Cygnus is scheduled to arrive at the space station Sunday, Oct. 23. Expedition 49 astronauts Takuya Onishi of the Japan Aerospace Exploration Agency and Kate Rubins of NASA will use the space station’s robotic arm to grapple Cygnus. This is the first flight on the upgraded Antares 230 launch vehicle, and the first launch from Wallops since an Antares rocket and its Cygnus spacecraft were lost in October 2014. It’s also the third flight of an enhanced Cygnus spacecraft featuring a greater payload capacity, supported by new fuel tanks and UltraFlex solar arrays.